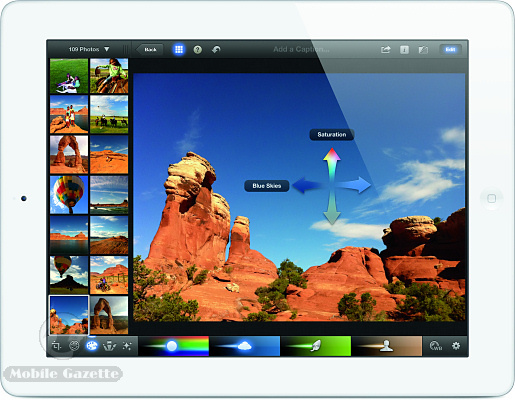 The Apple iPad 3 is Apple's third-generation tablet, and it improves on what was already the tablet to beat with an impressive specification set. It is not as revolutionary or outlandish as some rumours were suggesting - this latest iPad is more of a logical evolution of the previous device, but it must leave competitors wondering how they are going to catch up. The biggest change is perhaps not noticeable until you start using it - the iPad 3 now has a 1536 x 2048 pixel 9.7" display, with four times the pixel of the old iPads. As with the iPhone 4 and 4S, Apple call this a "retina display", meaning that the pixels are too small to see. The first iPad had a pretty much off-the-shelf panel that must have been very cheap to develop, but Apple can be sure that this new iPad will sell in enough quantities to justify creating a completely new class of display. Inside is a dual-core Apple A5X processor with a four-core graphics GPU. We don't know how that will compare with some of the monster four-core CPU Android tablets coming up this year, but we suspect that Apple's design will be very competitive. Raw processing power is nice, but there's more to making a tablet than that. On the back is a 5 megapixel camera (Apple call this the "iSight" camera) with a secondary "FaceTime" camera on the front for video calling. The iPad 2 had just 0.7 megapixels at the back but it could capture 720p HD video. The iPad 3's camera can capture 1080p video, but then Apple are also making a big deal of being able to edit digital images right on the iPad. Yes, the iPad 3 makes a really bulky camera, but it does mean that you can manipulate them straight away before emailing them off somewhere, and there are a number of other interesting built-in imaging features with a mass of related apps available to download as well. Surprisingly, the iPad 3 is actually thicker than the old iPad 2, coming in at 9.4mm thick compared to 8.8mm for the iPad 2. In reality it isn't a big deal, but it is also about 10% heavier which is definitely going the wrong way, coming in at between 652 and 662 grams compared to 601 to 613 grams for the iPad 2. As before, there's either a WiFi-only version or one that also supports cellular networks - we used to call that the 3G option, but (in the US at least) the new iPad is a 4G device capable of running on AT&T or Verizon's LTE networks. These versions are different from each other inasmuch as the Verizon one also has support for CDMA/EVDO in addition to the GSM/EDGE/HSPA+ support found on the AT&T one. The operating system is iOS 5.1 which is just like iOS 5 except better. As well as countless improvements to the operating system, the iPad 3 also comes with a speech-to-text dictation system, but not the excellent Siri feature found on the iPhone 4S. 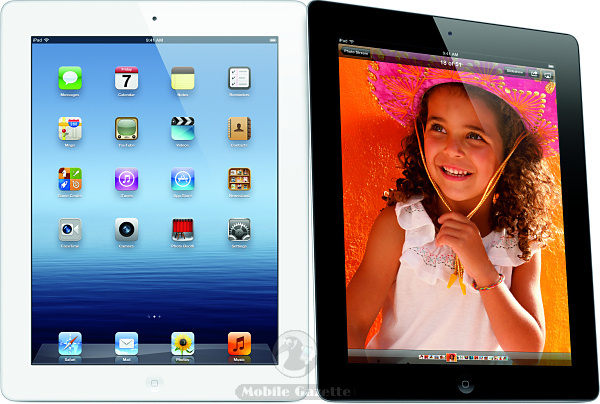 The iPad 3 is available with 16GB, 32GB or 64GB of internal flash memory. Inside is a 42.5 watt-hour battery capable of giving up to 10 hours of web surfing time on WiFi. The whole package measures 241 x 186 x 9.4mm. Prices for the iPad 3 vary in the US, starting at $499 for the 16GB WiFi-only version, going up to $829 for the WiFi plus LTE 64GB version, that is about the same at the iPad 2's pricing. 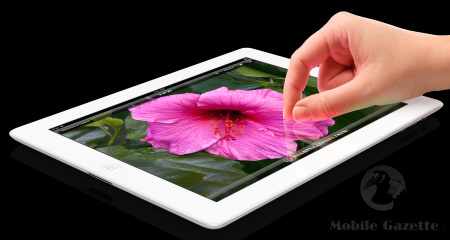 The good news is that the very capable iPad 2 is dropping in price by $100 and is now starting at $399. Officially, Apple are calling this just the "new iPad" and not the iPad 3, although we suspect that the iPad 3, iPad HD or iPad 4G names will become a common way of differentiating it. The iPad 3 should start shipping in the US, UK, Canada, Australia, Germany, France, Hong Kong, Japan and some other territories from March 16th with many more European countries by the end of the month.